The Mauritanian government must take additional measures to ensure a new law criminalizing slavery has an effect, human rights activists say. "The new law is a very positive first step. It is only a first step though," said Romana Cacchioli, Africa Program Coordinator for the British nongovernmental pressure group, Anti-Slavery International. "We don't eradicate slavery just by introducing a law." On Aug. 8, Mauritania's National Assembly unanimously adopted a law criminalizing slavery, which continues to exist in Mauritania in both traditional and contemporary forms. The law, passed by the Senate on Aug. 22, makes slavery punishable by 5-10 years in prison. It marks the first time in Mauritanian history that slaveholders have been sanctioned. However, in the wake of the International Day for the Remembrance of the Slave Trade and its Abolition on Aug. 23, local and international organizations are calling on the government to do more to give the law real meaning for the estimated half million slaves in Mauritania. "Accompanying measures are necessary so that this law is not forgotten—so that it actually contributes to the emancipation of former slaves," said Mamadou Moctar Sarr, executive secretary of the forum of national human rights organizations in Mauritania. "It's not too soon to start talking about the next steps that should be taken," said Julia Harrington of the Open Society Justice Initiative, an international program for law reform. "The existing law is not really going to be effective all by itself," she told IRIN from Nouakchott, where she was meeting with N.G.O. 's to discuss how best they could lobby the government. N.G.O. 's are asking for a monitoring and implementation mechanism that would apply the law, investigate allegations of slavery, mediate the release of slaves, and award compensation. "The passage of this law is incredibly important and symbolic, but there's still a lack of clarity about what its practical effect is going to be," Harrington said. As it stands now, victims of slavery must take their complaints to the police, "who probably don't have the mentality and definitely don't have the resources to implement the law." She said victims also need the legal right to take their masters to court in a civil suit, a provision that was not included in the law. The N.G.O. 's insist former slaves need social and economic reintegration projects if they are to be truly free. They want the government to set up welcome centers for slaves who leave their masters and give them access to land and income-generating activities. "Even if they are no longer slaves, as long as there is financial dependency, they will never be totally free," said Sarr, of the forum of Mauritanian human rights organizations. Another key demand is free education for children of slave descent. "All these people need to know their rights, so that they know that they are whole persons who should be proud of themselves," Sarr added. The groups say an awareness campaign is essential to spread the news that slavery is a criminal offence, and that it has been deemed incompatible with Islam. Mauritania is West Africa's only Islamic republic. According to Cacchioli, religious leaders have promised to talk about the abolition of slavery in their sermons. The groups are also pushing for a comprehensive law against discrimination, which would address the relationship between slavery and discrimination. "Many of the legacies of slavery are around discrimination," Cacchioli added, noting some people of slave descent have been prevented from owning land, accessing water, and running in elections. Slavery has existed for centuries in Mauritania, a Sahelian country that falls geographically and culturally between Arab North Africa and black sub-Saharan Africa. 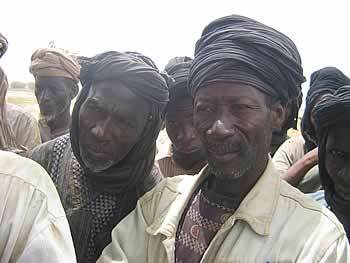 The enslavement of the black Arabic speakers (Haratines) is not limited to the upper class white Moores (Berber-Arabs) but also exists among black Africans, mostly of the Halpulaar and Soninké ethnic groups. Prevalence of the internationally banned practice is hard to quantify. One estimate by the Open Society Justice Initiative places the number of slaves and former slaves at 20 percent of the population – or about 500,000 people – but the organization says the numbers are impossible to confirm. According to most estimates, the Haratine cast—slaves, former slaves, or the descendants of slaves—make up between 40-50 percent of the Mauritanian population, although the government has not officially released results from the last census. Forms of slavery in Mauritania range from people who live independently but cannot get married without their master's permission to people who "don't get a single bit of food unless it comes from their master's hands, spend their lives looking after their masters, and get beaten every day," according to the Justice Initiative's Harrington. N.G.O. 's say that despite its shortcomings, the new law marks a huge shift in government attitude. Slavery was banned in Mauritania in 1981, but previous governments always denied the practice existed and the subject remained taboo. "This law is a recognition that the practice exists," said Boubacar Messaoud, president of S.O.S.-Esclaves, the local N.G.O. that led the push for an anti-slavery law. All N.G.O. 's contacted by IRIN said they believed Mauritania's first democratically elected government—elected in March 2007—was sincere in its promise to eradicate slavery and would take their requests seriously.